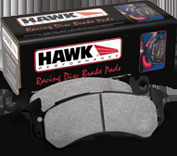 Hawk HP Plus Brake Pads are the highest performance pads designed for street cars by Hawk. Hawk HP Plus brake pads are designed to give you the highest braking performance possible while still being safe to drive on the street. HP Plus pads are designed with a Ferro-Carbon compound derived from motorsports technology and are designed for use at track days and autocross events where braking performance and resistance to fade are priorities. Because Hawk HP Plus brake pads are designed to be the best performing pads for street use, they will produce more brake dust, more noise, and more wear on both pads and rotors than more conservative pads. Hawk HP Plus brake pads are not recommended as a basic brake upgrade for daily driven cars, for that, the Hawk HPS is a better choice.